Making dinner from scratch is excellent, but there are many days when there just isn’t enough time. So, I like to call these quick and easy meals that are partly homemade. It took me under 30 minutes to make this, and I had plenty left over for lunch the next day. It’s vegetarian and gluten-free. Prepare Annie’s Gluten Free Rice Pasta as directed. I used unsweetened almond milk instead of regular milk. Rinse the broccoli and cut it so you just have the tops, and almost no stem. If you don’t use Ziploc Zip’n Steam Microwave Cooking Bag, you don’t know what you are missing — they changed the way I cook vegetables! For my half a bag of broccoli last night it took two minutes to prepare in the microwave (the cooking times are on the bags) and there was practically no cleanup. 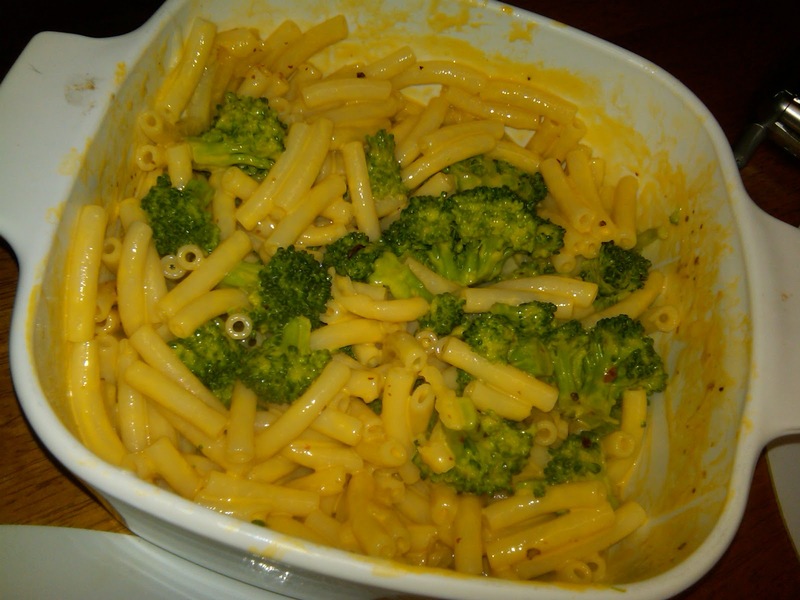 Combine the steamed broccoli with the pasta and cheese. Sprinkle with crushed red pepper flakes, stir and serve. This whole dinner was quick, easy and cost-effective, especially since there was enough to have the next day for lunch.